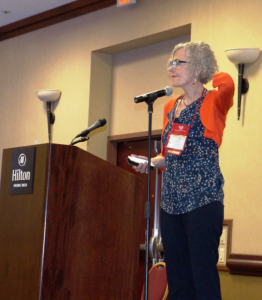 I had the privilege of attending and speaking at the 29th Annual Convention of the Association for Applied and Therapeutic Humor in Mesa, AZ earlier in April. I owe a huge debt of gratitude to Brenda Elsagher (this year’s convention chair) for introducing me to the organization and encouraging me to submit a proposal to provide a break-out session. Not only was my message well-received, the attendees and overall spirit of the conference was something I had never experienced before. Humor enthusiasts and practitioners from a vast array of vocations and avocations welcomed and embraced me with remarkable sincerity. The speakers, both keynote and break-out, shared information, research and experiences that unanimously highlighted the significant benefit of mirthful laughter. I have taken courses in stand-up comedy and improvisation, with the intent of adding more humor to my speaking. The fruits of that learning are yet to be fully realized. (You can watch my stand-up routine here and decide for yourself.) It is much harder than it looks. Setting the intention to use these skills and have them be an authentic part of my message and mission is a challenge. My experience at AATH was enough inspiration to make it a priority, however. Laughter relaxes your whole body. It’s like internal jogging. Laughter is contagious – and does not have anything to do with germs. Laughter boosts immunity – less stress = more good cells to fight infection. Laughter increases resilience – it really is easier to recover with a sense of humor. Laughter combats depression – it gets more endorphins circulating in your system. Laugh often. It really is good medicine! !